Now that it seems the monsoons are here, we need to protect our tomato plants from fungal diseases. Here in the southwest we don’t get the dreaded Late Blight that the Northeast has experienced (not yet at least) because we are drier than most parts of the US. We don’t seem to get as many fungal diseases but we do get some. The one I see the most in everyone’s garden is Early Blight on tomatoes. It starts anytime but especially under these conditions: when you water your tomatoes from the top, the humidity is higher, and the rain comes. Early Blight lives in the soil and is transmitted by water splashing soil up on the lower leaves. It starts on the lower branches and leaves where they start to turn blotchy yellow and start dying from the bottom up and will continue up your plant and eventually kill it. 1. I water with a drip system, thereby keeping the soil from splashing up on the lower leaves. 2. I put straw all around the bottom of the plant to help keep the soil splashing up on the plant when it rains. 3. I trim any branch throughout the season that is going to touch the ground. In fact, I trim all the way up to the first flower or fruit set. 4. I trim ANY branch that shows signs of Early Blight no matter how high it is on the plant. 5. I dip my scissors or shears in rubbing alcohol or a 10% bleach solution between trimming plants to avoid spreading diseases. Bleach breaks down quickly (in a day or two), so don’t reuse it-make a new batch. 4. I spray ‘Serenade’, an organic fungicide which provides protection from a broad spectrum of common fungal and bacterial diseases. 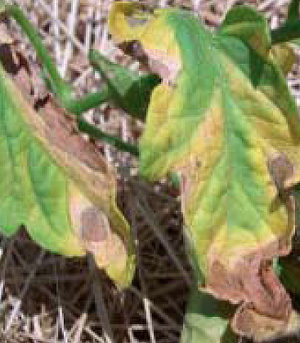 Early blight is one of the diseases it can control. Spray it on when the leaves are dry. It is rainproof and is non-toxic for bees and other beneficial insects. Respray every 7 days. Spray all parts of the plant-both on top and underneath. Serenade is also good to spray on other vegetables. Spray for powdery mildew on squash, cucumbers and melons and leaf rust on beans. I use it for all my vegetables. Now that the rainy season is here, don’t wait till you get the disease—it works best as a preventative. You can get Serenade from Agua Fria Nursery (call for availability) here in Santa Fe or at Amazon.com. I buy the concentrate, not the little bottle of pre-made spray—lasts a lot longer. This entry was posted in DISEASE CONTROL, general, TOMATOES, tomatoes growing tips and tagged Early blight, growing tomatoes, organic disease control, tomato fungal diseases, tomatoes, vegetable gardening. Thanks for this excellent info, especially about Serenade concentrate. It would be a shame to lose these plants we have struggled to keep alive for so long without any real rainfall until recently. I have been struck with early blight on 4 out 16 plants this year. I’ve never had it before and I don’t know how it got to me. I live out in the country and there are no other gardens around. This year I upgraded my garden and built all raised beds and filled them with fresh topsoil. Installed a drip system for each raised bed, put down fabric and then mulch on top of that in the entire garden. I’m pretty upset as I worked my tail off on this garden. I will prune all the bad branches off and spray with a fungicide and hope like heck it doesn’t get to the other plants. I grew all my plants from seed this year in my own mini green house so I know it didnt come from the store. Early Blight is a soil-borne fungal disease. If you water from above or it rains, the soil splashes up onto the lower leaves which show the first signs of the disease-yellow blotchy spots and the leaves eventually die. Cut off all the lower branches and spray with a fungicide called ‘Serenade’. You might be able to get it at a nursery or definitely at Amazon online and spray the whole plant including the undersides of the leaves. Also put straw around your plant to keep the soil from splashing up on them. Keep spraying the plants and you will get control of it IF they are not too far gone. Sounds like you are doing all the right things..